Alimak rack & pinion industrial lifts are used in all kinds of industries. With these lifts, customers are better able to access, monitor and service key processes in their plants. Developed to withstand the extreme conditions of the world’s most hostile environments, Alimak lifts have taken a strong position in the Offshore, Steel works, Cement and Power industries. Alimak SE passenger and freight elevators are designed from the drawing board not only to excel as people carriers in multiple applications, but also to be able to handle materials weighting up to 3,300 kilograms. All Alimak elevators are built to last in the harshest environments. Alimak Hek has been an industry leader in supplying elevators based on rack & pinion drive technology for almost 50 years. Over 30,000 Alimak Hek rack & pinion solutions have been installed for a broad spectrum of industries around the world, giving us a unique and extensive engineering knowledge platform based on each individual installation. Elevators from Alimak Hek daily demonstrate their ability to withstand the toughest challenges, providing safe, reliable access, anytime and anywhere needed, from silos, chimneys, and boiler houses, to warehouses, container cranes, underground shafts, hull columns, and derrick towers. The enhanced efficiency delivered by the Alimak SE line stems in part from the unique modular design of the cars that provides a remarkable 40 different car sizes within the standard range. All elevators are based on a variety of wall panels made of the Alimak self locking, aluminium profiles. These wall panels meet different elevator needs, and create adaptable floor and roof configurations. 2011 sees us launch an extension to the ALIMAK SE elevator range. Larger elevator cars, increased capacity and stiffer, stronger car designs are key benefits of the latest range. Remote Monitoring System – The online A3 remote control can also be added to monitor elevator operations 24/7 and pro-actively trace faults should they arise to reduce downtime. For other demands or specification, please consult your Alimak Hek representative. Built on the experience gained from thousands of installations worldwide, the new ALIMAK SE-Ex is designed to deliver on your access requirements for heavy transport needs in hazardous environments. The ALIMAK SE-Ex sets a new benchmark for the safer, efficient vertical transportation of personnel and materials on derricks, hull columns, platform modules, oil refineries, LNG terminals, chemical plants and other similar industrial environments. 2011 sees us launch an extended range of the ALIMAK SE-Ex explosion protected elevator range. Larger elevator cars, increased capacity and stiffer, stronger car design are key benefits of the latest extended range. The ALIMAK SE-Ex enables safer transportation of workers and materials in potentially hazardous areas. 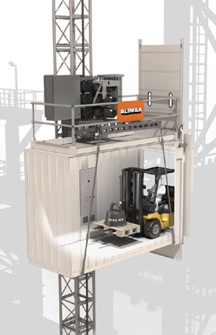 Increased efficiency, productivity and safety are just three of the benefits delivered by the new Alimak SE-Ex range of freight and passenger elevator solutions from the company that pioneered the rack and pinion drive system back in 1962 to safely and efficiently transport people and materials. The enhanced efficiency delivered by the Alimak SE-Ex stems in part from the unique modular design of the cars that provide many different car sizes within the standard range. All elevators are based on a variety of wall panels made of the characteristic Alimak self locking, aluminum profiles. These wall panels meet different elevator needs, and create adaptable floor and roof configurations. A more rigid car design is built on a solid car floor and stiffened beams, which supports greater load capacity on a single mast. The well proven Alimak Lift Control system ALC-II ensures both efficiency and ease of use. As an added bonus, Alimak Heks’ online A3 remote monitoring system can be fitted as an accessory. This gives the ability to fully monitor the elevator and trace any faults instantly from remote locations. This enhancement to our standard control system can speed up corrective diagnostics and minimize downtime. Remote Monitoring System – The online A3 remote control can also be added to monitor elevator operations 24/7 and pro-actively trace faults should they arise to avoid downtime. 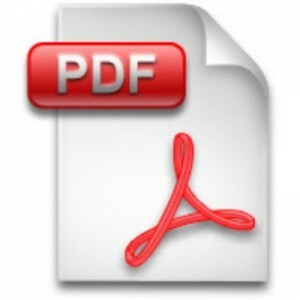 For other demands or specifications, please consult your Alimak Hek representative. 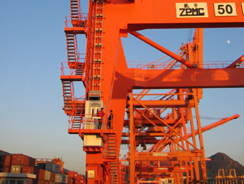 Since 1971, Alimak lifts have been used by global port authorities as access lifts for ship to shore cranes as well as RTGs and RMGs. Alimak crane lifts are installed in almost 100 countries thorughout the world. Why a crane lift? 1. Availability: Experience shows that the installation of access lifts results in more efficient maintenance and, consequently, less downtime. Additional savings are realized because tools and exchange parts are carried in the lift car, thus eliminating waiting time. It has also been possible to reduce breakdowns appreciably as the lift has facilitated preventive maintenance. A leading shipping company says our lifts have reduced crane maintenance and downtime by up to 25%. 2. Productivity: Without a lift, maintenance personnel and crane operators must climb ladders. To get to the top of an ordinary container crane takes some 15–20 minutes of hard work which does not encourage frequent maintenance and inspection. Moreover, parts and tools required for repairs and exchange have to be lifted by means of winches or similar devices – all time consuming operations. In a lift, the ride to the top takes less than two minutes. 3. Safety: Although it is difficult to put a price tag on safety, the risks associated with ladders, especially in bad weather, are obvious. Additionally, the lift enables speedy rescue operations. This special 3.5 tonne lift literally pops up from under the street. It is used by the Stockholm Water Company to transport service personnel and replacement parts to a pumping station 4 m below ground. Four external, panoramic lifts provide access to the new footbridge in London’s Docklands. Each car takes 11 passengers and the total height of travel is 14 m.
A twin-masted platform with a capacity of 12 tonnes is used by the Ministry of Public Works to service the new Telecommunications Centre. The platform travels a total of 62 m.